Canada will provide up to $8.3 million to Iraq and neighbouring countries to fight ISIS militants, Foreign Affairs Minister Rob Nicholson said Thursday after closed-door meetings in Quebec City. Canada will provide up to $8.3 million to Iraq and neighbouring countries to fight the Islamic State of Iraq and Syria, Foreign Affairs Minister Rob Nicholson said Thursday after closed-door meetings in Quebec City. Nicholson said the money will help fund defence programs in Iraq, as well as supply non-lethal equipment to countries in the region, to help them secure their borders and contain the flow of foreign fighters. "We will not stand idly by while [ISIS] and its affiliates continue their murderous rampage in an attempt to wreak havoc across the region, spawn splinter cells from North Africa to South Asia and prey on youngsters in the West," he said. The meeting was the second time in two months representatives gathered behind closed doors to talk about how the the fight against ISIS can be improved. On June 2, an anti-ISIS coalition conference was held in in Paris. Thursday's meeting, held at Château Frontenac, included representatives from countries such as Australia, Saudi Arabia, Germany and the United Arab Emirates. It was co-chaired by Canada, the United States and Iraq. On Thursday afternoon, Iraq Foreign Minister Ibrahim al-Jaafari came out of the discussions to talk to the media. Through a translator, he said the talks were encouraging. 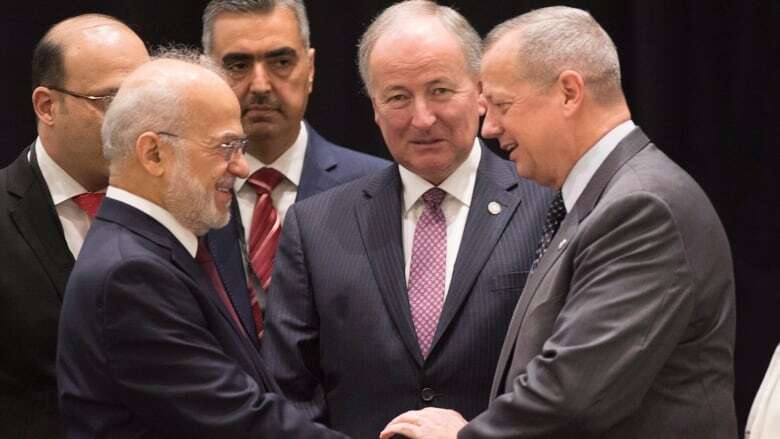 "Compared to previous conferences, I have realized that this conference has come beyond sympathy and sentiment with Iraq to concrete accomplishments," al-Jaafari said. Al-Jaafari said he did not ask for ground troops but did appeal for more military support. He did not say what the coalition members have committed to. Canada will stay involved in the anti-ISIS campaign until spring 2016. Last March, Parliament passed a motion renewing Canada's mission to fight ISIS for another 12 months and to include air strikes in Syria as part of its mission. The conference explored all aspects on the fight against ISIS, not just military initiatives. One example includes delving into how members of ISIS treat women and girls. 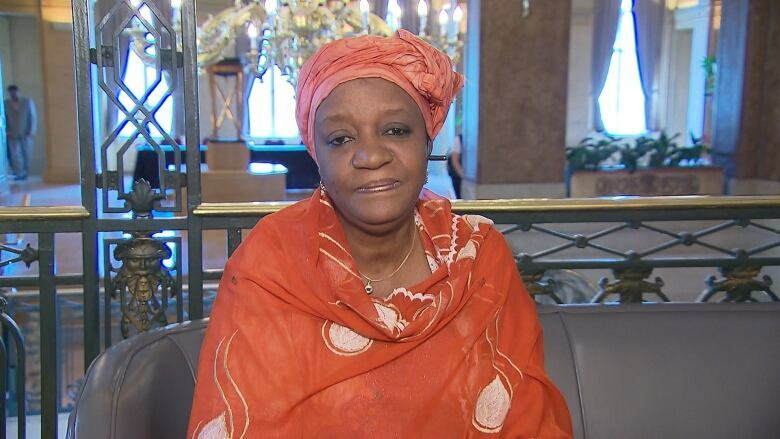 Zainab Bangura, United Nations special representative on sexual violence in conflict, is in Quebec City to tell the coalition that the brutalization of women is a key part of ISIS's strategy. (CBC)"Minorities and the women and girls targeted by ISIS are not incidental victims of terror but are deliberately selected by ISIS and are even used to recruit, encourage and reward its fighters," Nicholson said in a statement earlier this week. Zainab Bangura, United Nations special representative on sexual violence in conflict, says the international community has to do more to prevent that from happening. "The issue of sexual violence has been institutionalized by ISIS. The brutalization of women is part of their key strategy," Bangura told CBC News on the eve of the conference. Last spring, Bangura travelled to five Middle Eastern countries to gather first-hand accounts of sexual atrocities committed against women at the hands of ISIS. She said naked women are sold at market like cattle, with manuals on how to sell slaves and deal with them. Bangura says women and children make up 80 per cent of the refugees in the ISIS conflict. Bangura was to make recommendations to the coalition, stressing that there cannot be peace in Middle Eastern conflict zones unless women are protected too. "That is very central because women form the core of society, all the fabric of society together and I think we've neglected it to focus more on the issue of military and other assets." Nicholson said Canada supports efforts to prevent sexual violence in conflict zones, and is providing $8 million to the cause. "Minorities and the women and girls targeted by ISIS are not incidental victims of terror but are deliberately selected by ISIS and are even used to recruit, encourage and reward its fighters," he said, adding that financial aid goes to local and international organizations that support victims of sexual violence. The Canadian government says it has so far spent more than $940 million in military and humanitarian assistance in the fight against ISIS. Is Canada's ISIS mission ready for Syria's moral maze? Are we losing the war against ISIS?